These small 4″ by 8″ signs were meant to be mounted to doors. 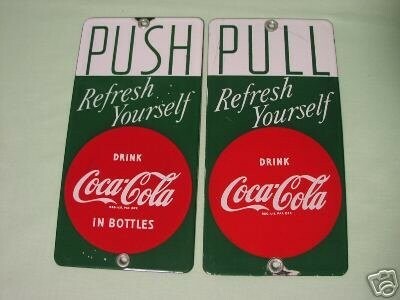 The text on these Drink Coca-Cola signs reads “Push Pull Refresh Yourself Drink Coca-Cola In Bottles.” The last portion of the text is written in a red circle. The rest of the signs are green and white.